DOODÁ (Absolutely No) DESERT ROCK POWER PLANT! As part of a California-wide March tour, Elouise Brown will be speaking and showing films at the Subrosa Cafe in downtown Santa Cruz on the evening of Monday, March 22nd. 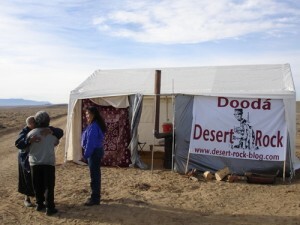 Elouise Brown is a Diné (Navajo) traditionalist and president of the Doodá Desert Rock committee. She will speak about dangers posed by the coal industry, the exploitation of indigenous land by energy companies, and the ongoing struggle to prevent the Desert Rock plant from ever existing. Since December of 2006, the community of Chaco Rio in the Navajo Nation (SW of Farmington, New Mexico) has been blockading entry to the site of a proposed 1,500 megawatt coal fired power plant. Desert Rock would be the third coal plant within a 20-mile radius in a region already suffering from extreme levels of toxic emissions. Elouise will also be doing a 12:00 noon presentation at Cabrillo College on Tuesday the 23rd, and a 7:00pm presentation at the Brown Berets office in downtown Watsonville, also on the 23rd. "We believe economic development must not come at the expense of the health of our children, the air we breathe, our sacred land and water, and our way of life. As children of Mother Earth and Father Sky, we are honored and obligated to protect and preserve the natural state of Harmony and Beauty." "As long as I'm alive this power plant is not going to happen."